Back in the fifteenth century, in a tiny village near Nuremberg, lived a family with 18 children. Yes, eighteen! In order to merely keep food on the table for this mob, the father and head of the household, a goldsmith by profession, worked almost 18 hours a day at his trade, as well as any other paying chore he could find in the neighborhood. Despite their seemingly hopeless condition Albrecht and Albert, two of the elder children, had a dream. They both wanted to pursue their talent for art, but they were fully aware of the fact that their father would never be financially able to send either of them to the art academy. After many long discussions at night, in their crowded bed, the two boys finally worked out a pact. They would toss a coin. The loser would go down into the nearby mines and, with his earnings, support his brother who would attended the academy. Then, after four years, when the brother who won the coin toss completed his studies, he would in turn support the mining brother to also attend the academy – either with sales of his artwork or, if necessary, also by laboring in the mines. They tossed a coin on a Sunday morning. Albrecht Durer won the toss and went off to Nuremberg to study art. Albert went down into the dangerous mines and, for the next four years, financed his brother whose work at the academy was an almost immediate sensation. Albrecht’s etchings, his woodcuts, and his oils were far better than those of most of his fellow students and even those of his professors, and by the time he graduated, he was beginning to earn considerable fees for his commissioned works. More than 450 years have passed. By now, Albrecht Durer’s hundreds of masterful works – portraits, pen and silver-point sketches, water colors, charcoals, woodcuts, and copper engravings – hang in every great museum in the world. But the odds are great, that you, like most people, are familiar with only one of Albrecht Durer’s works. More than being familiar with it, you very well may have a reproduction hanging in your home or office. Yes, you guessed it. 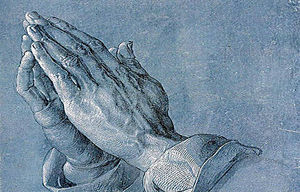 One day, to pay homage to Albert for all that he had sacrificed, Albrecht Durer painstakingly drew his brother’s abused hands with palms together and thin fingers stretched skyward. He called his powerful drawing simply Hands, but the entire world almost immediately opened their hearts to his great masterpiece and renamed his tribute of love “The Praying Hands”. The next time you see a copy of this touching creation, take a second look. Let it be your reminder that no one ever makes it alone. One must have the grace of others, as well. This is truly a story of enormous unconditional love and grace. I studied history of art and humanities at university for five years and received a degree. Albrecht Durer was one of my favorite artists that I studied. However, I never heard this touching story before. I wish I knew the name of the author that I derived much of this information from, so that I can credit him accordingly, but he is unknown. In any case, I hope you receive as much value as I did from the grace between these brothers.